Jukebox musicals have been scoffed at as ear candy but then there are some, like Jersey Boys and Beautiful, that offer an irresistible mix of catchy songs and innovative dancing at a treadmill pace that keep the audiences coming. 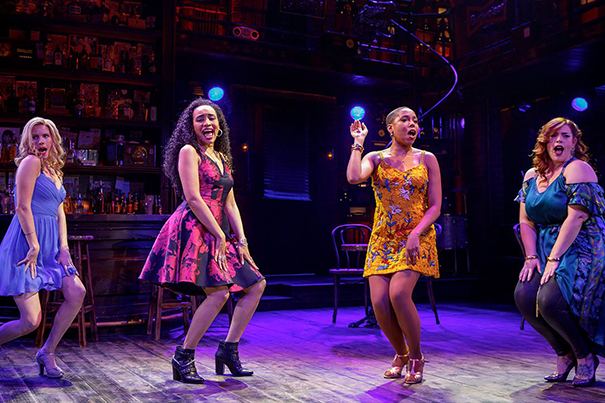 Add to these, Smokey Joe's Cafe, now in a steamroller revival at Stage 42 with nine exuberant performers who frizzle with energy on the intimate off-Broadway stage without even trying. Not that they don't break a sweat. They do. With boundless oomph, they knock out a 90-minute revue of '50's and '60's hit songs that audiences remember and love. The 40 songs by lyricist Jerry Leiber and composer Mike Stoller date back to the early R&B favorites including Big Mama Thornton who introduced Leiber and Stoller's first hit, "Hound Dog" in 1952. Thornton and the hound went on to influence the styles and vocals of Elvis Presley and Janis Joplin. 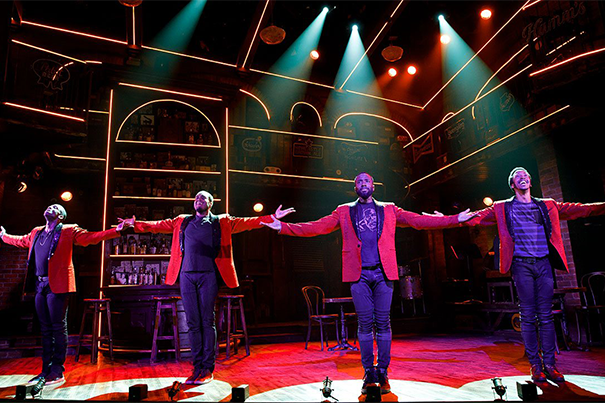 Director/choreographer Joshua Bergasse stages a snazzy production for this revival of the 1995 revival, a perfect fit for the intimate off-Broadway venue. Beowulf Boritt designed a wood-paneled neighborhood bar, highlighted by Jeff Croiter's old radios and curved metal staircases leading to a second level where the exuberant performers strut their stuff costumed in Alejo Viett's colorful, witty designs. Bergasse, with new arrangements by Sonny Paladino, provides innovative new looks to old tunes, giving each performer a solo star turn. Nicole Vanessa Ortiz delivers a fierce message to the boyfriend who turned into a "Hound Dog." She later delivers a heartbreaker with "Fools Fall in Love," a song revealing the melodic, bluesy irresistibility of Stoller's music. Tenor Jelani Remi's "Jailhouse Rock" is ignited with his no-hold-barred dance routine with Elvis moves -- and then some. Emma Degersterdt, in layers of a pink fringe mini, steps up-and-out with several shaky minutes in “Teach Me How to Do the Shimmy." Graceful Dionne D. Figgins is sensuous with "Spanish Harlem" with Jelani crooning the dreamy lyrics. With Dwayne Cooper, Dionne sizzles in "Don Juan" and lures in the boys with "Dance With Me." Max Sangerman and the men join in doo-wop harmony for "Loving You." Max, Nicole and Alysha get set to travel to "Kansas City," and Kyle Taylor Parker leads the company in a comic, "Along Came Jones" and later, "Love Potion #9." The charismatic company keeps up the energy as they bop off the stage and around the audience with "Yakety Yak" and "Charlie Brown." The eight-piece band is tucked to the side although players step up for specialty accompaniments. From the upper level, Alysha Umphress' country flavor tells the regretful story of a chanteuse who did not quite make it, "Pearl's a Singer." She also goes all-out honky tonk with "Trouble" ("My name is misery"). A cover rendition of an Italian hit in 1961 is an audience favorite when John Edwards passionately delivers, “I Who Have Nothing” and later offers, "Stand By Me." The show wraps around the opener/closer, "Neighborhood," as the older kids from the block spot friends they once knew. Not haute cuisine, Smokey Joe's Cafe is a tasty must-see powerhouse menu of entertainment that hopefully will not be transferred to Broadway. It's happy just where it is. Cast: Dwayne Cooper, Emma Degerstedt, John Edwards, Dionne D. Figgins, Nicole Vanessa Ortiz, Kyle Taylor Parker, Jelani Remy, Max Sangerman, and Alysha Umphress.